Happy Friday! I have so many things to show you today – there’s a little bit of everything here. 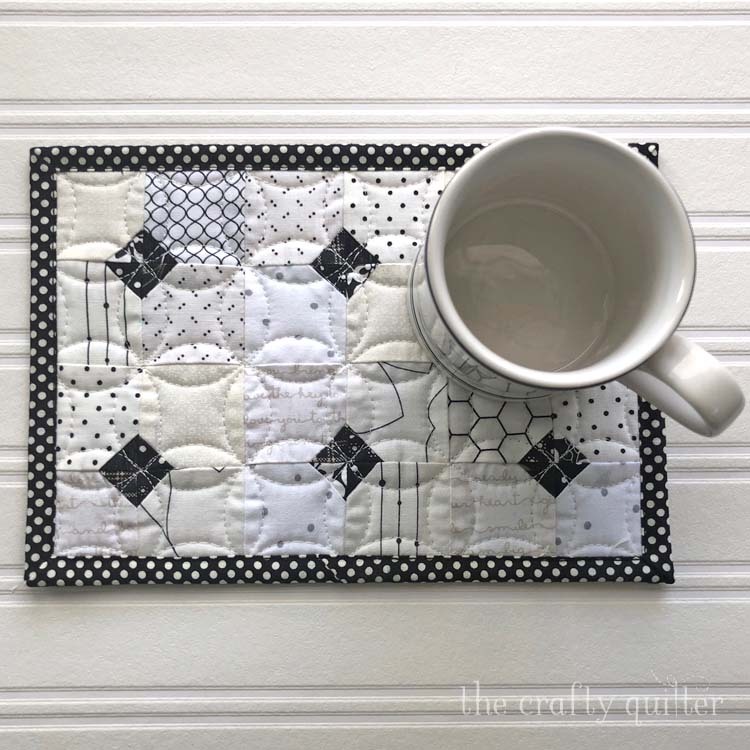 A new mug rug that I made for someone special, a new sewing room that is keeping me very busy, a quick little tip, and my baby granddaughter, Clara, turned one! The designer that I worked with for our remodel was wonderful and I wanted to make her something special as a thank you. Since she loves to drink tea, I thought a new mug rug would be perfect. I designed this one to resemble the tile floor in our bathroom (which she helped bring to life). I used scraps of black and white prints to create the simple blocks and I found the perfect backing fabric in my stash. Don’t ask me what it is – I won’t be able to find it for a while! 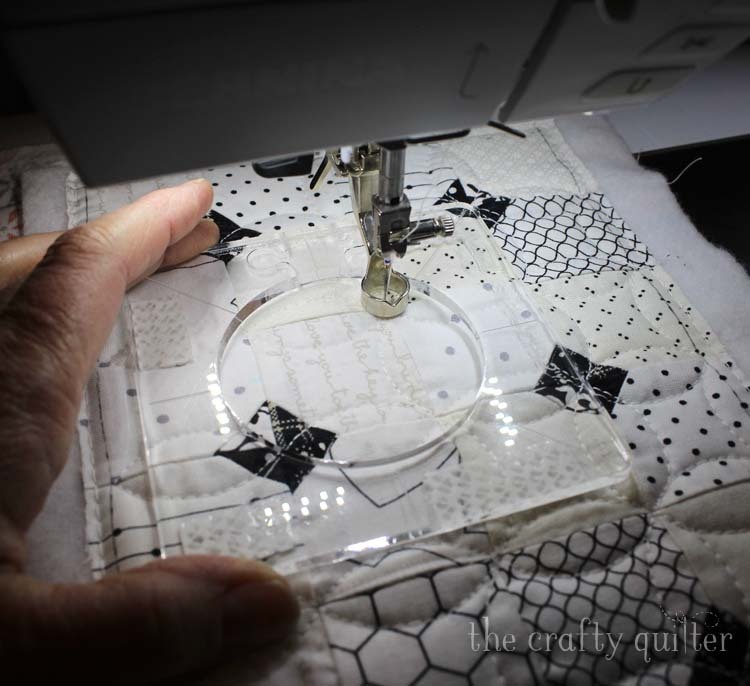 The quilting was done using a free motion ruler foot and circle ruler from Westalee. I wanted to make an orange peel design, so I only used a small section of the circle, but it was just the right size. I’m still new to this technique, so I really don’t have any advice for you (other than just go for it). 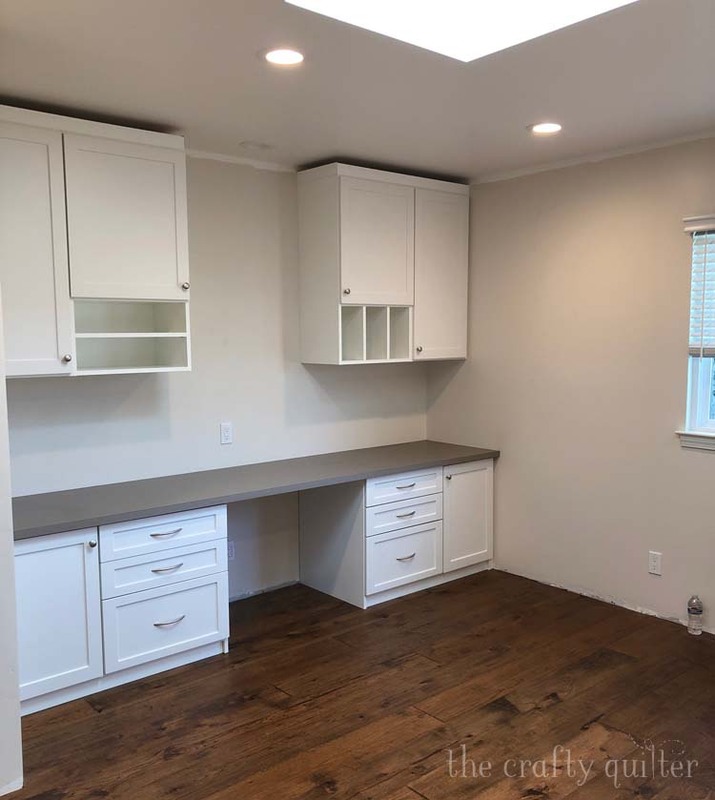 I have a brand new sewing room and I’m moving in! 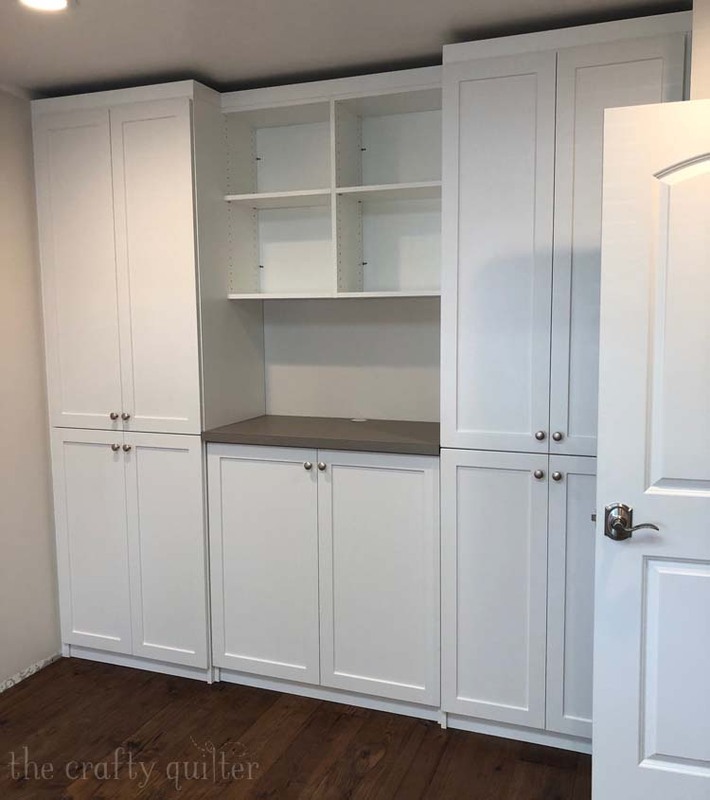 I had custom cabinets from the Closet Factory installed along two walls. The shorter wall will hold most of my stash and finished quilts along with project/class containers. I just found (as in yesterday) a clear plastic storage container from the Container Store for my fabric. It’s called a sweater box, and it holds two rows of folded fabric perfectly. I have mostly half yards and fat quarters. You can see the new container next to the old ones in the second photo, for comparison. My old containers are Sterilite 15 qt. and they have served me well for 10 years, but it’s time to upgrade (plus I’ll have more space for more fabric – don’t tell Mr. Crafty Quilter). The second wall of cabinets will hold notions, scrap booking supplies and paperwork. I’ll also have my Juki sewing machine set up in the middle and there is a slide out table to the left (not shown) to place a cutting board or ironing surface on to. I tested out this set up yesterday and it’s divine. I will do a full reveal once everything is pretty and sparkling. Here’s a quick tip for today. 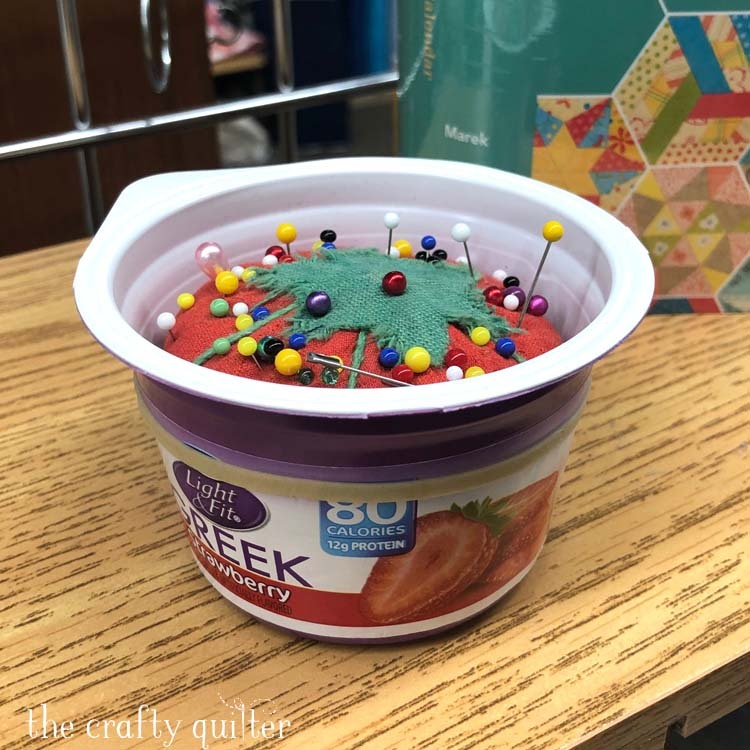 I taught a class last weekend at The Granary Quilt Shop and one of my students, Brenda, was using an old fashioned tomato pin cushion – but in a new way. She had it sitting in an empty yogurt container. It fit perfectly and made it more transportable and pack-able. I thought this was such a great idea, that I had to take a picture. This is one of the many benefits of teaching classes; I get to learn from my students, too! 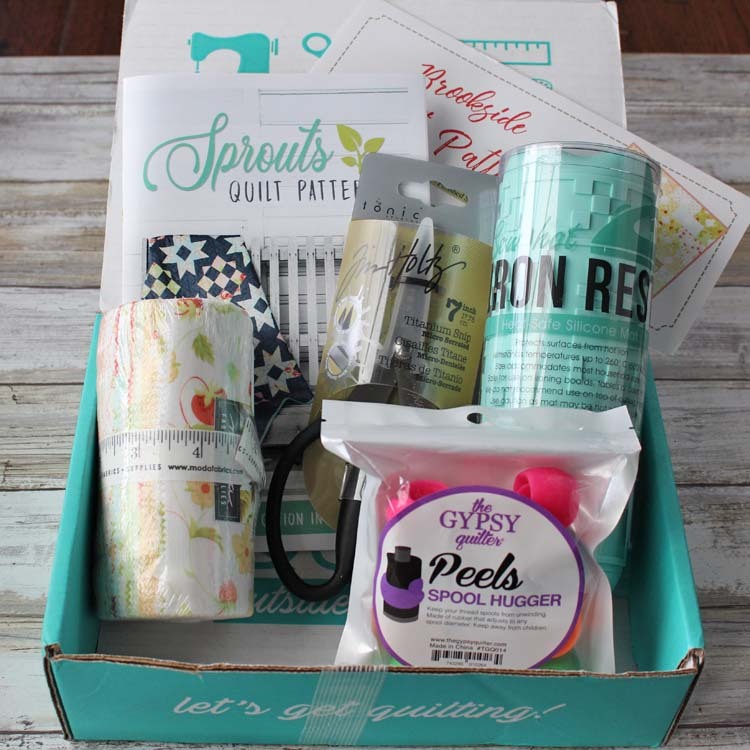 I received my last Sew Sampler subscription box from Fat Quarter Shop a few weeks ago. It has been a wonderful year of surprises each month. Last month’s box was probably my favorite of them all. 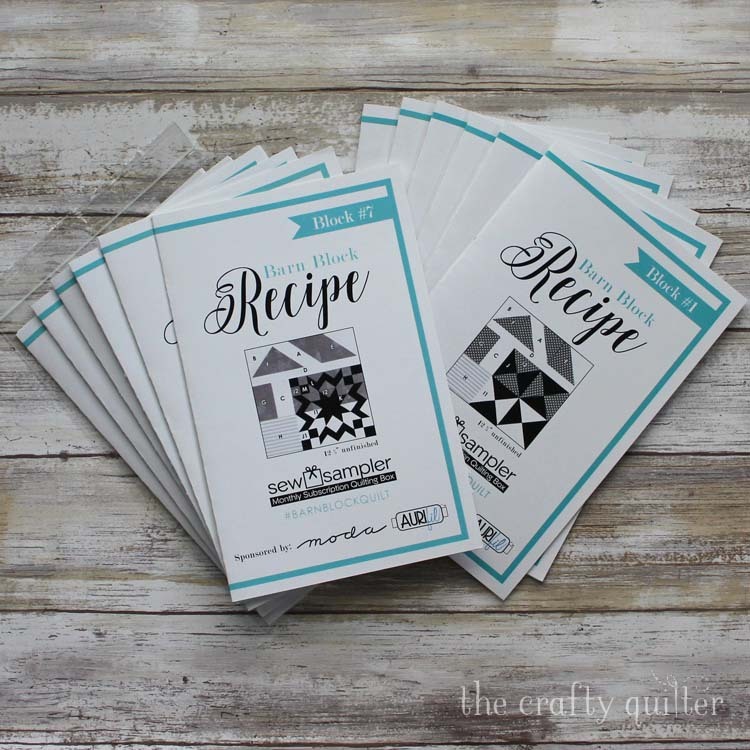 Each month included a Barn Block recipe to make a 12″ quilt block. I hope to get these on my “to do” list this year. 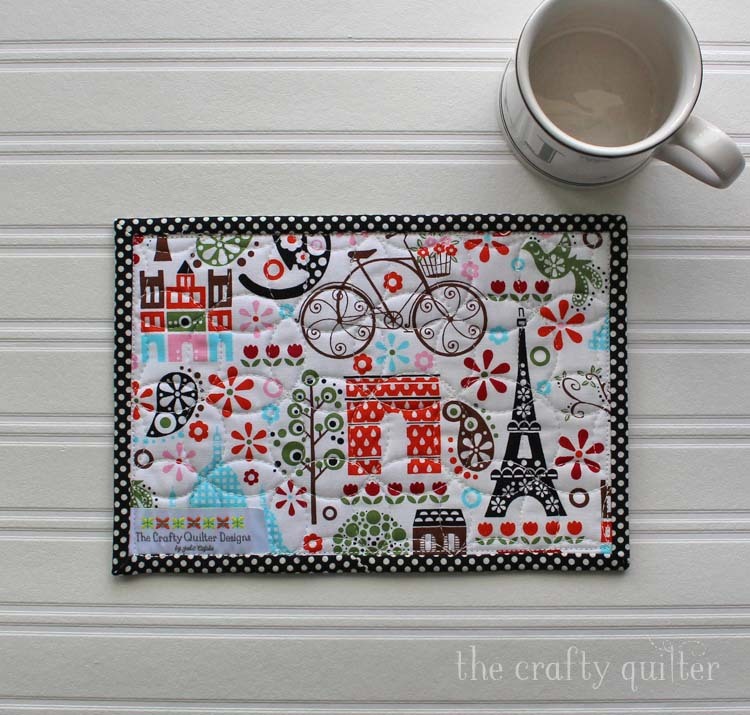 You can read about all of the Sew Sampler contents at The Jolly Jabber (Fat Quarter Shop’s blog). 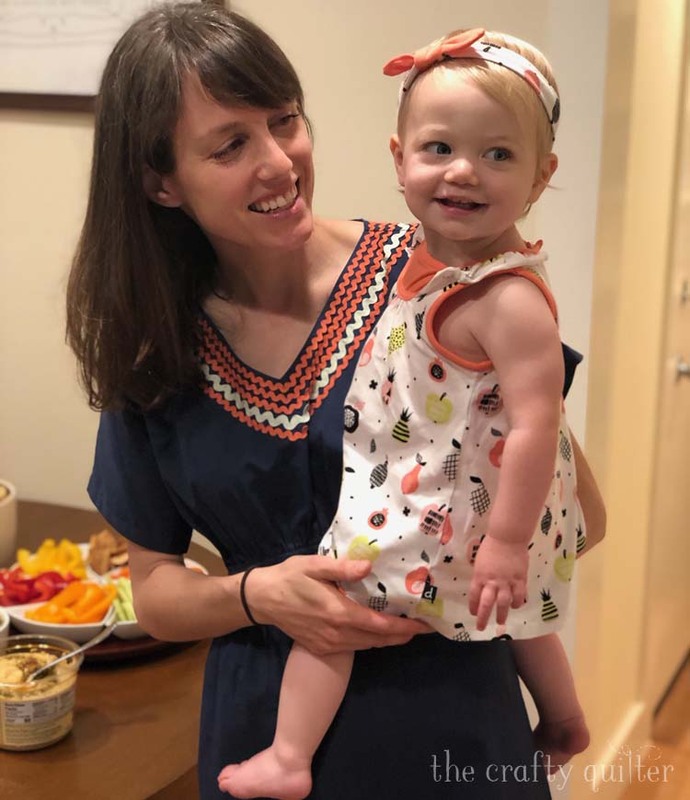 Last, but certainly not least, is my “baby” granddaughter Clara’s first birthday. We were not able to be in Austin for this one, but they’re coming to visit in three weeks! I’ll get caught up on all of the snuggles and hugs then. And I’ll take lots of pictures. That’s all for Friday! I hope you have a great weekend ahead of you. Don’t forget, there’s still time to add a photo of your finished UFO or WIP project to the link-up. So far there are 48 entries. Let’s make it an even 50! 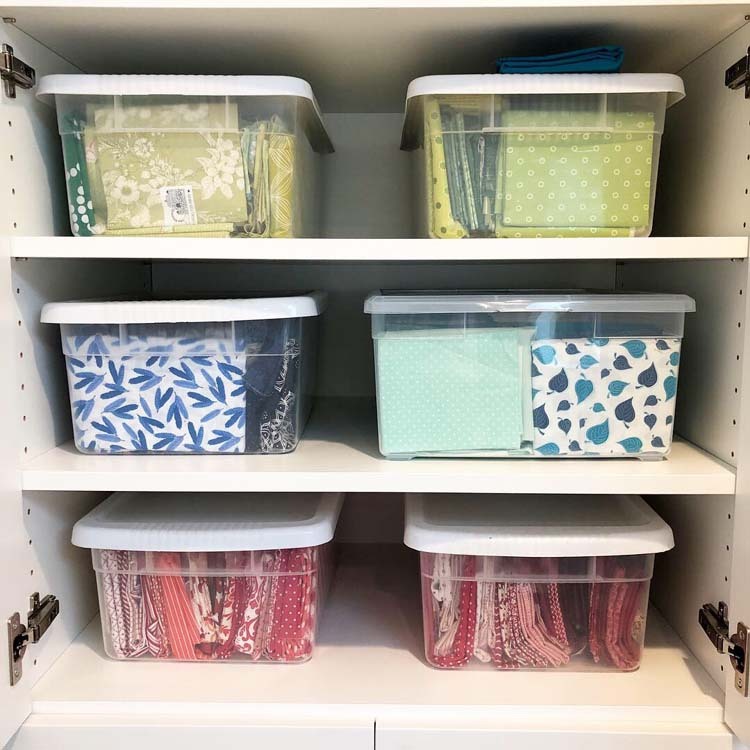 Love your new sewing space. I’m sure you can’t wait to jump in and get organized (you probably have already done that!) I have wanted to try free motion sewing with rulers but the only quilt shop offering classes i attended just closed in March. 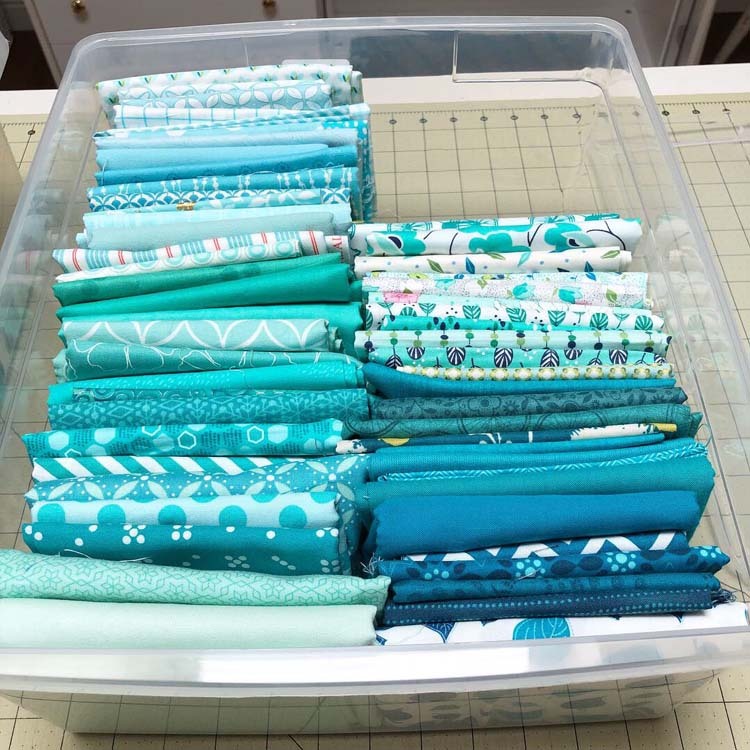 I will have to look into this sometime….I would enjoy a monthly Sew Sampler-but would not have the time, so I opted for the FQS Button Lovers Club–yup, i broke down last year and signed up. I will too probably end after 1 year. Awww your grand daughter is so cute… I know you can’t wait to see her!! A big Happy Birthday to baby Clara!! How sweet she is! God’s Blessings upon all of you! Wonderful to see your sewing room coming together Julie. The mug rug is adorable too. Happy Birthday to your sweet Clara! Beautiful photo of your daughter and granddaughter. I have been trying out my new ruler foot and I love your orange peel design. This circle ruler will be next on my shopping list. Your sewing studio is wonderful and I am anxiously waiting for more pictures. Thank you for sharing. Loved everything! 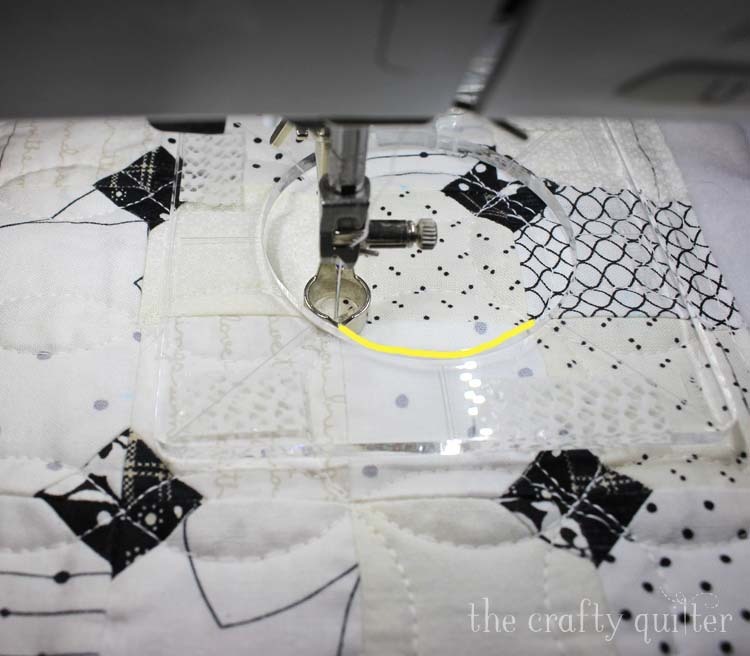 Your new quilt studio is awesome and little Clara is a sweetheart! I am wondering how you keep the circle unit from slipping while you are quilting. Especially on a larger piece. Sew envious! Your studio looks about perfect. I love your mug rug and the fabric on the back is great. I bet you’re in heaven with your new studio and lovely family coming. Good for you! Your new sewing and Ciara are beautiful! Is there a pattern for the mug rug? A fresh, clean and ready-to-set-up sewing room, what a joy! I can only wish – sigh! But even so, I have a decent little room with my machines, cutting table and ironing board set in a U-configuration so it works well. And I’m lucky and grateful to have it. The picture of your granddaughter is exquisite. She has gorgeous eyes. And are my eyes fooling me? Is her mother tiny or is she a big girl for only a year old? She looks to be the same size as my great-granddaughter who is almost 2 1/2! Can’t wait to see the pictures you take when they come visit. Clara is a doll. I took a class for the Westalee rulers and found out it will just take a lot of practice to use them. I do like them though. Hello Julie, Your new sewing room is fabulous! I can only imagine all of the excitement you are feeling with getting everything set up and in working order again. Have fun with all of your house redecorating process! Your daughter and granddaughter are both beautiful! Thank you for sharing and have a splendid day! Thank you for sharing your lovely photos. This whole post made me smile and your granddaughter is gorgeous. Julie! You are such an inspiration! Love this project and it is definitely on my to do list! Your room is coming along beautifully. Finally, your girls are so cute! As a grandmother with grands close in age I love seeing them. Such blessings! I love getting you emails. Your sewing room is going to awesome, just a little jealous. Clara and her mom and pretty darn cute too! Julie, how wonderful, and beautiful, everything is that you shared with us!! Gorgeous mug rug, family, and new sewing room. Enjoy all of it. and that 1st birthday! Looking forward to more pictures- thanks!! Happy Birthday Clara! Ooo! I love your new digs, Julie! You will be sewing in seventh heaven!!! Thank you for sharing your projects. Great sewing studio.